Picture - The Bristol Type 192 Belvedere tandem rotor helicopter. The Bristol Type 192 Belvedere is a British twin-engine, tandem rotor military helicopter built by the Bristol Aeroplane Company. It was designed for a variety of transport roles including troop transport, supply dropping and casualty evacuation. It was operated by the Royal Air Force (RAF) from 1961 to 1969. The Belvedere was based on the Bristol Type 173 10-seat (later 16-seat) civil helicopter which first flew on 3 January 1952. The 173 project was cancelled in 1956 and Bristol spent time on the Type 191 and Type 193 to Royal Navy and Canadian Forces specifications. The RAF expressed an interest in the aircraft and the Type 192 Belvedere was created. The first Type 192 prototype XG447 flew on 5 July 1958 with tandem wooden rotor blades, a completely manual control system and a castored, fixed quadricycle undercarriage. From the fifth prototype, the rotors fitted were all-metal, 4 bladed units. Production model controls and instruments allowed night operations. 26 Belvederes were built entering service as the Belvedere HC Mark 1 The Belvederes were originally designed for use with the Royal Navy but were later adapted to carry 18 fully-equipped troops with a total load capacity of 6,000 lb (2,700 kg). The two rotors were synchronised to prevent blade collision through a shaft, allowing the aircraft to operate through only one engine in the event of an emergency. The first prototype Belvedere went to the Belvedere Trials Unit at RAF Odiham, which was subsequently reformed as No. 66 Squadron RAF in 1961. Engine starter problems caused trouble early on but operational deployment continued. The prototype saw service in Europe, Africa, South Arabia and Borneo. XG447 was broken up at Boscombe Down on 7 August 1966. As well as 66 Squadron, the type was deployed to 72 Squadron in 1961 and 26 Squadron in 1962 all at RAF Odiham. 26 Squadron later transferred to RAF Khormaksar where it disbanded in November 1965. The helicopters were transferred by HMS Albion to Singapore to join 66 Squadron until the squadron was disbanded in 1969. 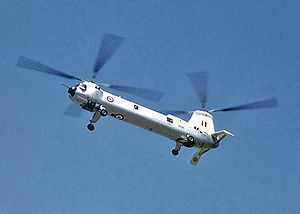 72 Squadron kept its Belvederes until August 1964 when it exchanged them for Westland Wessex. The RAF Belvederes were involved in combat in Aden and Borneo. Its capability of transporting 18 fully armed troops or freight was really appreciated by the British Army. Picture - Belvedere XG459 at the SBAC show, Farnborough, 9 September 1961. Projected naval version. Never flown; first two aircraft used as Gazelle ground test rigs for Type 192. Military transport helicopter for the Royal Air Force, under designation 'Belvedere HC.Mk 1. The following Bristol Belvederes have been preserved and are either on display or currently undergoing restoration.